Oscar Pistorius, a bilateral amputee, was barred from the 400-meter dash at the 2008 Olympic Games in Beijing, and other able-body races. 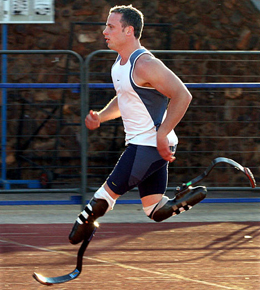 The International Association of Athletics Federations that barred Pistorius claimed his Cheetah Flex-Foot prostheses provided significant advantages over non-amputee competitors. U. COLORADO (US)—Amputees who use running-specific prosthetic legs have no performance advantage over counterparts who use their biological legs, according to a recent study. A debate on the matter was spurred when Oscar Pistorius, a bilateral amputee, was barred from the 400-meter dash at the 2008 Olympic Games in Beijing, and other able-body races. The International Association of Athletics Federations that barred Pistorius claimed his Cheetah Flex-Foot prostheses provided significant advantages over non-amputee competitors, agreeing with other studies that found prostheses reduce the energy cost of running. In addition, some have proposed that the lighter weight of specially designed sport prostheses facilitates a quicker swing of the leg. The new study was published in Biology Letters, a journal of the Royal Society in London, and is coauthored by researchers from the Massachusetts Institute of Technology, University of Texas at Austin, Orthopedic Specialty Hospital in Utah, and University of Colorado at Boulder. After Pistorius was barred from the Olympic Games in January of last year, the U.S. research team presented findings in April 2008 to the Court of Arbitration for Sport in Lausanne, Switzerland, that were key in the reversal of the ban on Pistorius. Data in the study include new measurements taken from an analysis of six unilateral amputees. The comparison of the amputees’ prosthetic legs to their biological legs provided a more controlled test, according to Kram. The researchers measured forces exerted on the ground and leg “swing times” while the unilateral amputees ran on a high-speed treadmill at the Orthopedic Specialty Hospital. The running-specific prostheses impaired the force production of runners by an average of 9 percent. Force production is generally believed to be the key factor behind running speed. No differences in leg swing times were measured. One of Kram’s undergraduate students, Matt Beale, also analyzed video from the 2008 Olympic and Paralympic Games.